The first View of 2014 is coming to you from Larks Notes This! Pretty sure she is someone I met at Yeah Write. Interested in politics, parenting, food, and pop culture. Laughter is the best medicine. Unless you have pneumonia. Then take antibiotics. She is a fellow Washingtonian, was chosen one of BlogHer's 2013 Voices of the Year, is funny and smart, and her post for this series is something I'm fairly certain so many of us can relate to. She hasn't posted on her own blog since the end of NaBloPoMo in November, so I'm pretty flattered that she wrote for me today. 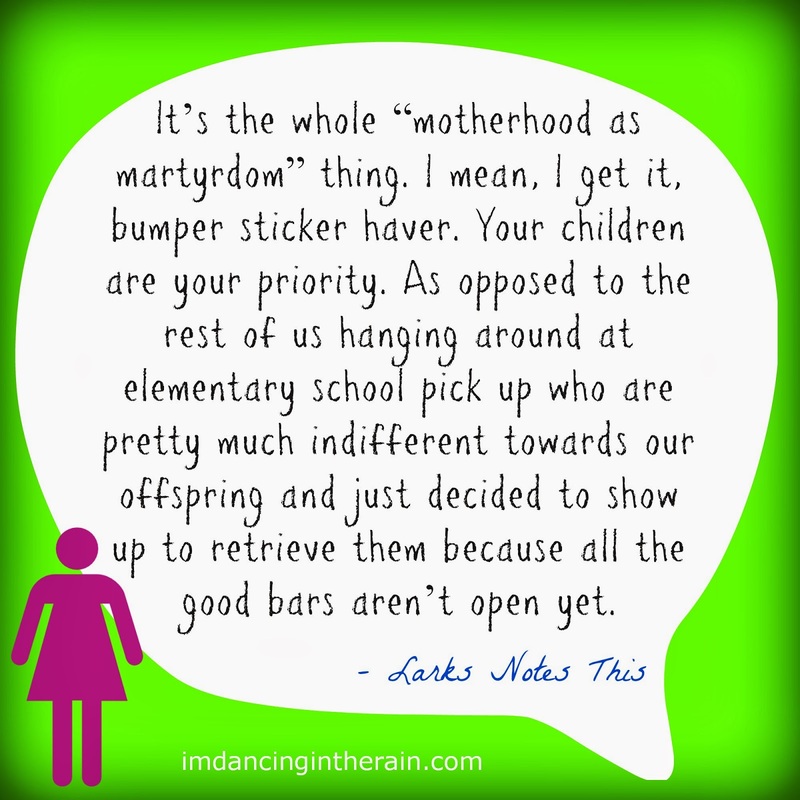 It’s the whole “motherhood as martyrdom” thing. I mean, I get it, bumper sticker haver. Your children are your priority. As opposed to the rest of us hanging around at elementary school pick up who are pretty much indifferent towards our offspring and just decided to show up to retrieve them because all the good bars aren’t open yet. I was going through my Instagram feed the other day as kind of a “year in review” exercise. There’s a lot of random stuff in there, some worth saving, some not. My daughter making Christmas cookies. A pacifier with a mustache attachment. So many sunsets. Even a dude wearing a possum like a Baby Bjorn for hill people. But you know what’s not in there? Me. Okay, okay so that’s not entirely true. There are two pictures of my feet and one picture of me ill advisedly going down a three story high slide in a maxi dress. But out of hundreds upon hundreds of snapshots that’s it. I’m not in the picture. And it’s not just because I don’t know how to take a selfie. It’s that it never occurred to me to do so. As I reflect back on 2013 I can’t help but think this is emblematic of a larger issue. I wear a lot of hats. We all do. I’m a lover of red wine and red nail polish, a wife, a Doctor Who fan, a Seattleite, an awkward jogger and yoga enthusiast, a feminist, a reader of everything from Pablo Neruda to Cassandra Clare, a writer, a Michael Buble skeptic. And so many more things. But over the past five years one label has subsumed my identity: Mother. What can I do to promote early reading skills? Why is everyone at Monster High emaciated? How can I put healthy family dinners together every. single. night. while sticking to a tight food budget? All of these are important questions and mother is an important role, but at some point it bled into everything else. And I am no longer in the picture. Literally. As my daughter grows older and needs me less this thought becomes increasingly unsettling. I don’t want her to grow up thinking that once you have kids it’s all hideous jeans and saccharine conversations that use “the children” as strawmen. Yet here I am, the not so proud owner of a grand total of one pair of jeans that are vaguely flattering. And I just spent twenty minutes talking to a woman who used the phrases “our little blessings” and “think of THE CHILDREN!” at least a dozen times. Clearly I’m in need of some mother-life balance. Not that I need or want to focus on my family less. I just need to focus on myself more, dust off some of my other hats, and remember what it feels like to wear them. I want to be a lot of things, but a seriously annoying bumper sticker isn't one of them. Happens all the time, doesn't it?